One of our best parties of the year, our Tree Trimming Party & Open House is sure to get you in the holiday spirit. Join us on November 27th from 2:30 pm to 5:00 pm as we eat, drink and get our merry on! Help decorate our tree, tour our facility and get to know our learners. We will also have a small 'boutique' onsite where you can browse or purchase items made by our learners who are applying their skills learned in class to social enterprise. Please let Karen know if you plan to attend. 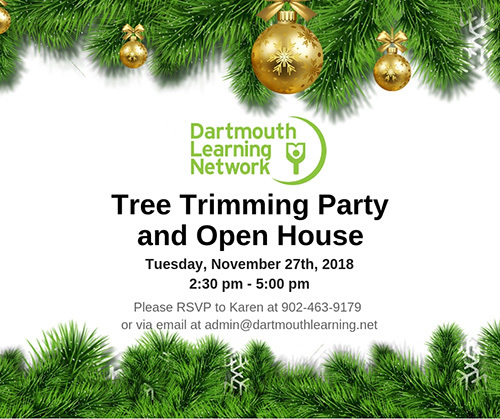 Karen can be reached at 902-463-9179 or via email at admin@dartmouthlearning.net.